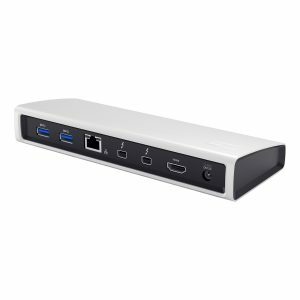 The universal i-tec U3METALDOCK USB 3.0 Docking Station is equipped with three graphics outputs, making it the perfect accessory for your USB 3.0 equipped notebook. Full HD+ resolution is supported via the HDMI (2048 x 1152 @ 60 Hz, 2560 x 1440 @ 50 Hz), DVI-I (2048 x 1152 @ 60 Hz), and DisplayPort (2560 x 1600 @ 60 Hz). 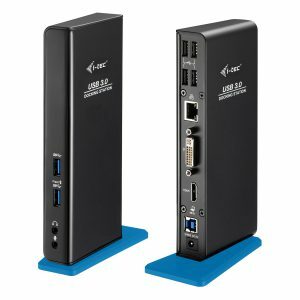 3x USB 3.0 ports (incl. 1x Fast Charge port) make it easy to connect all of your existing hardware. 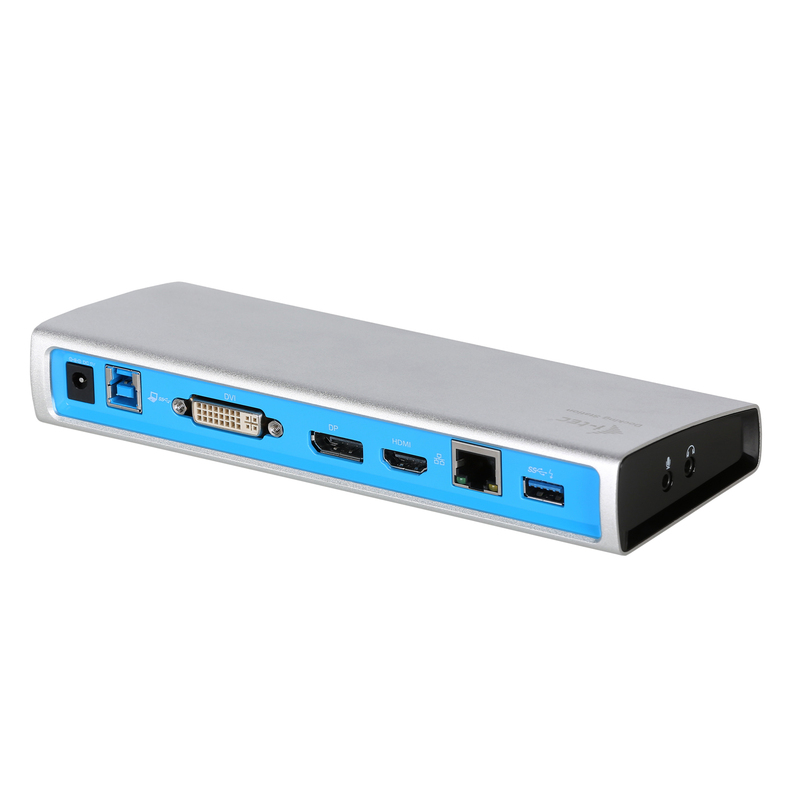 Take advantage of the USB 3.0 Fast port to charge your tablet, smartphone or camera, while working. The Gigabit Ethernet RJ45 port provides reliable, robust and high-speed internet connection, supporting 10 / 100 / 1000 Mbps speeds. 3.5 mm audio input/output jacks for your microphone, speakers or headphones are conveniently located on the side of the docking station. The elegant design and brushed aluminium finish make the U3METALDOCK ideal for use with your MacBook or Ultrabook. The docking station is designed to be used as a notebook stand (anti-slip pads are provided) if desk space is at a premium. i-tec docking stations are compatible with the vast majority of notebook brands and platforms, making it easier than ever to connect your favourite hardware. 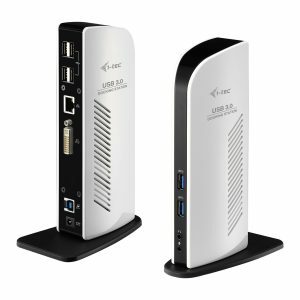 The connection of all hardware through a single device, via one SuperSpeed USB 3.0 port, helps to keep your workspace clean, tidy, and free from cables. Only two graphics outputs can be used simultaneously: DVI-I and HDMI or DisplayPort. If monitors are connected to the HDMI and DisplayPort, preference will be given to the DisplayPort; the HDMI will be disconnected. Hardware requirements: notebook / tablet with OS Win 8 / PC with a free port USB 3.0 / 2.0. 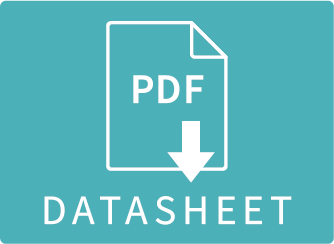 If you have USB 2.0, the data transfer speed will be reduced. Procesor CPU 2.0 GHz Dual Core and higher Intel Pentium/Celeron or AMD, memory 2GB RAM. For playing a DVD on an additional monitor the processor shall be at least Intel Pentium 2.0 and higher, 1 GB RAM and a screen resolution shall be 800×600 and 16 colors. 2.0 GHz Dual Core processor, or better. The docking station will enable easy and fast connection of your favorite equipment to your laptop/tablet or PC, using a single USB cable.